Avengers: Infinity War is soon to grace the big screens and it is everything a Marvel fan could ever hope for. It’s got action, it’s got the story, and it’s got a full blown CGI carnival extraordinaire. 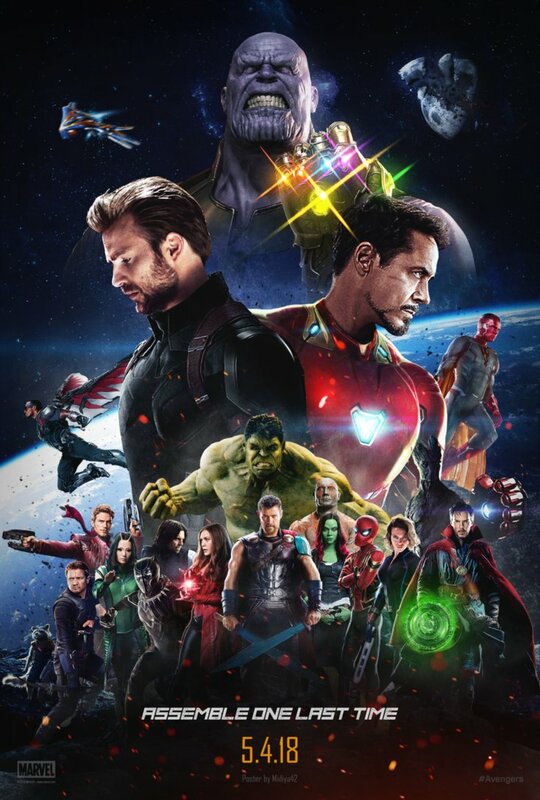 But the thing that everyone wants to see in Avengers: Infinity War is their favorite Marvel Superheroes sharing screen space for the first time in one big epic production. Although, the Infinity war cast is stacked up with heavy-weights but the most important comic-book character is Thanos. Till now, he has been teased in Marvel movies in post-credits of Phase 2, 3 films, but Infinity war will be the first major project where he is going to be the big baddie hellbent on destroying the worlds. 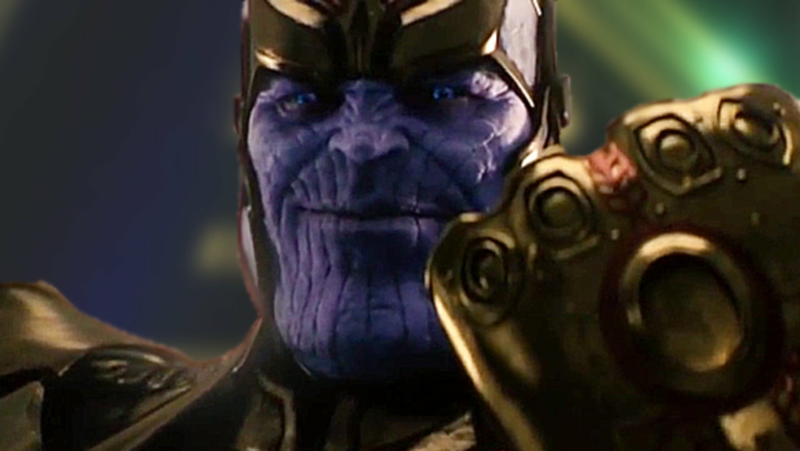 In the recently released record-breaking trailer, we saw actor Josh Brolin playing super-villain Thanos and his transformation into the most powerful cosmic being in the galaxy is terrifying as hell. 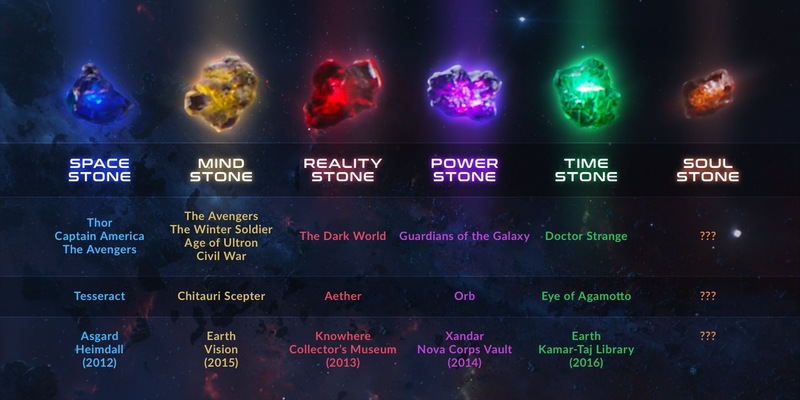 For the first time, we saw the massive powers of Infinity gems, each of them individually is powerful but collectively they can rewrite reality and destroy worlds. How could anyone forget the purple maniac and megalomaniac from outer space!! The Thanos is going to fight Earth’s mightiest heroes in a cosmic battle royale. He is stealing Infinity gems one by one. There are six gems out of which five have been discovered and the location of sixth is still unknown. 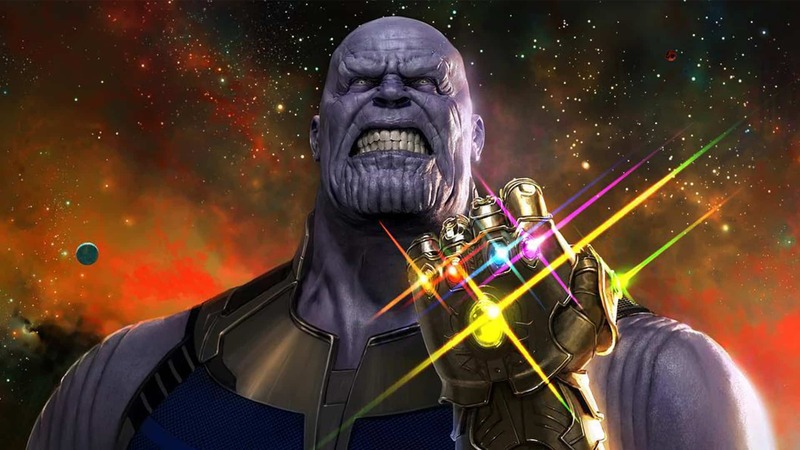 With the help of Infinity Stones, Thanos could destroy half the life in the universe, as he did in the comics. The entire MCU has led us to this moment when the ultimate baddie the Mad Titan himself will reveal himself and cause mayhem and carnage everywhere. If that doesn’t get you riled up, I don’t know what will. 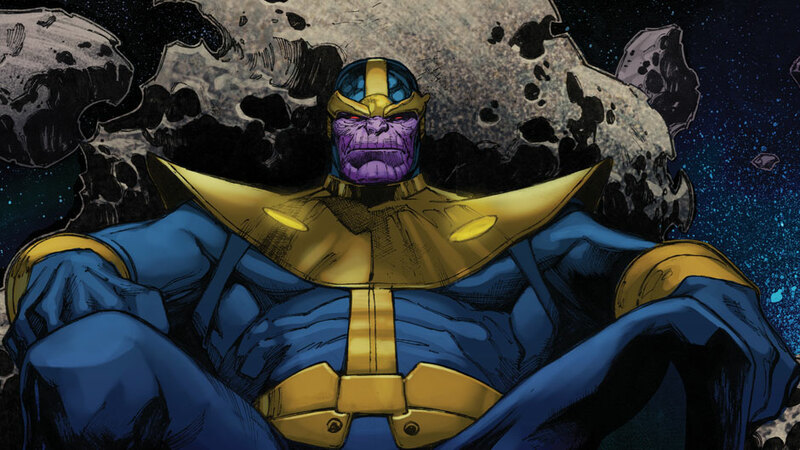 Thanos’s journey into villainy in the Marvel Universe is as interesting as it is noteworthy. 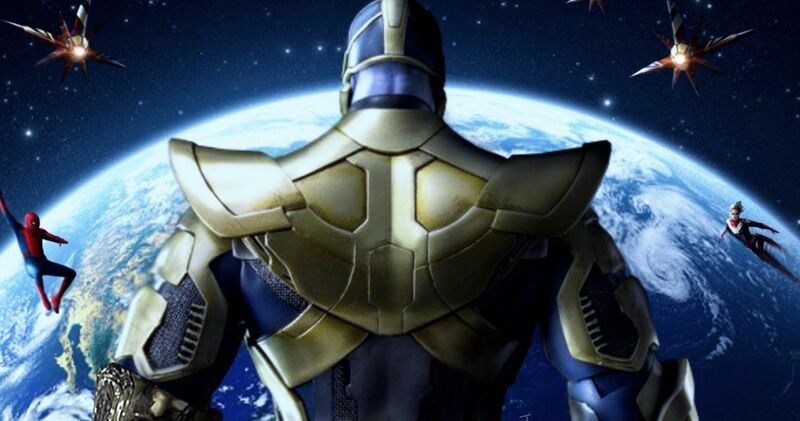 Thanos is a member of the Eternals, a race of super powered humanoids that reside in Saturn’s moon Titan. He is the son of prominent Eternals Mentor and Sui-San. But Thanos was different than his fellow Eternals. He carries within him the Deviant gene, the race that is the sworn enemy of the Eternals since the dawn of time. It is the very reason his mother once tried to kill him. Thanos survived her and later became a pacifist. He loathed all forms of violence. Then in his adolescence, Thanos literally fell in love with Mistress Death – the embodiment of death in Marvel Universe. 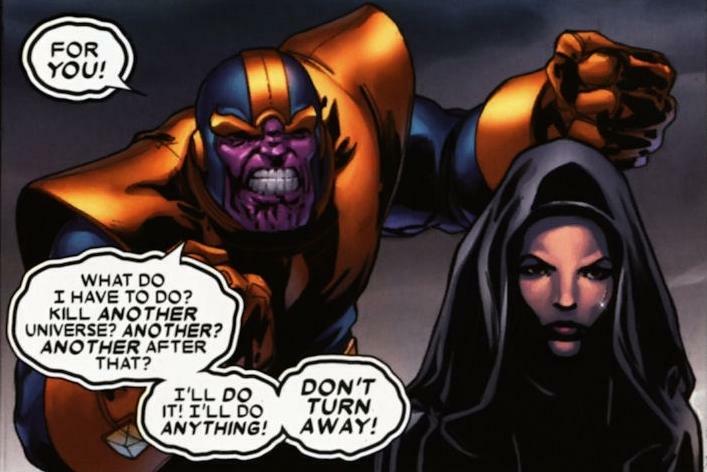 To win her heart, Thanos murders his wife and children and offers them to her. When that does not win her over, Thanos enhances himself mystically and technologically to go on a quest to win the entire universe for her. And that is when he hears the tale of the Infinity Gauntlet and the Infinity stones on Earth. He then decides to pay Earth and it’s superheroes a little visit. And this is how The Infinity War saga begins in the comic books and in the movies (more or less). Thanos is the embodiment of all evil things in Marvel Universe. His entire life has been spent on solely achieving one single objective – obtaining power beyond one’s wildest imaginations. 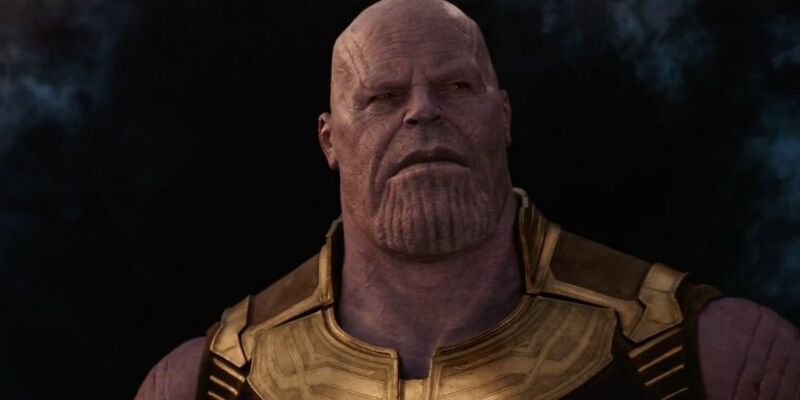 Over time, Thanos has become a nihilist and relishes death and brutality in their highest forms. His fearsome reputation throughout the Universe means nothing dares stand in his way. If anyone does, they are quickly dealt with ruthless efficiency. So when the Avengers face off against Thanos in Avengers: Infinity War, expect many heads to roll. It will be a symphony of death and destruction as Thanos begins his onslaught on Earth. A lot of heroes will die. 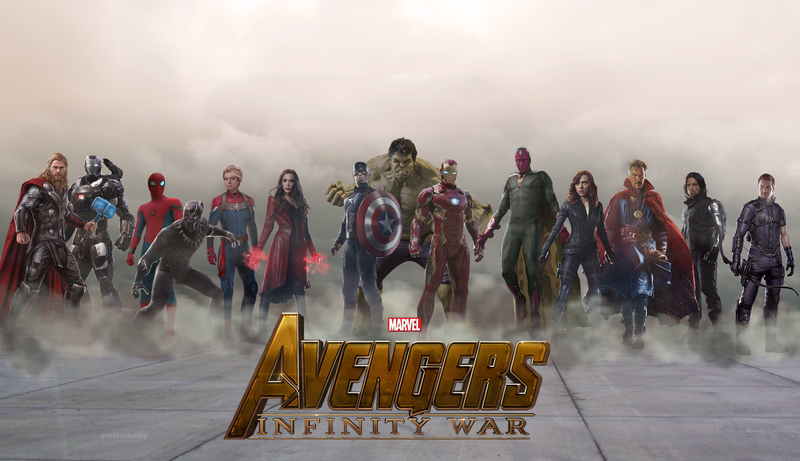 So the question that is everyone’s minds right now is – which superhero will survive the Infinity War saga? New Avengers 4 set photos reveal that a major Avenger may survive Thanos’s quest to obtain the infinity stones. And it is someone everyone thought will surely die in Avengers: Infinity War. Prepare to have your minds blown, ladies and gentlemen. It’s Vision. Paul Bettany’s character has a high probability of surviving Thanos and his Black Order. 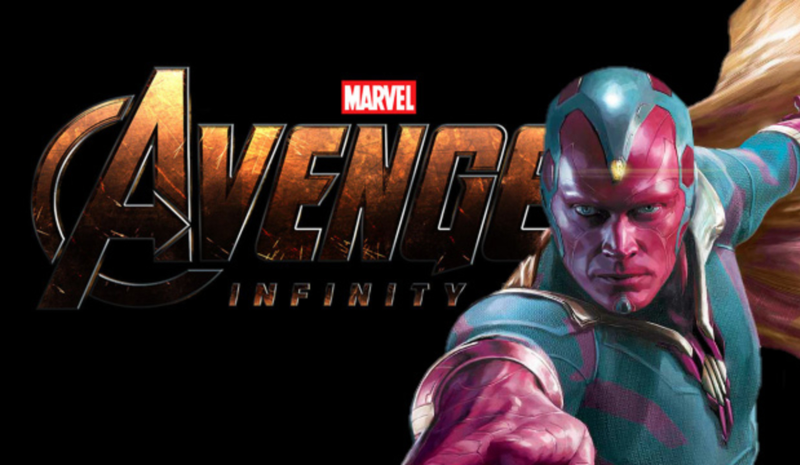 Fans have believed that Vision is most likely going to die as Thanos will come for the Infinity stone (Mind gem). 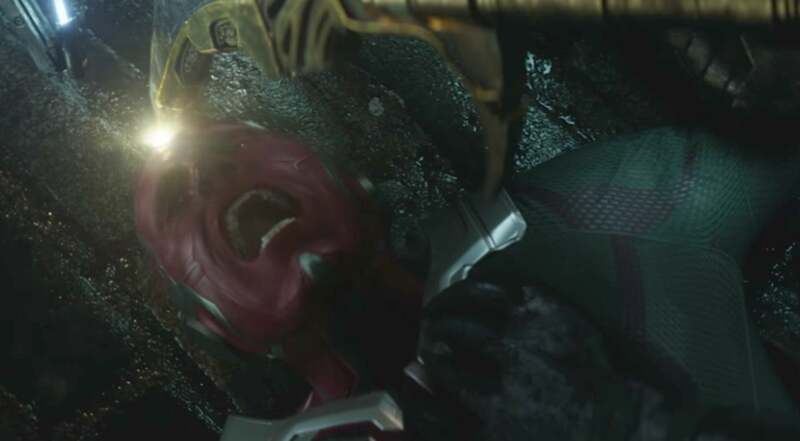 As seen in the trailer, Vision could be seen pinned to the ground as someone pierced the mind stone on his forehead with a staff. 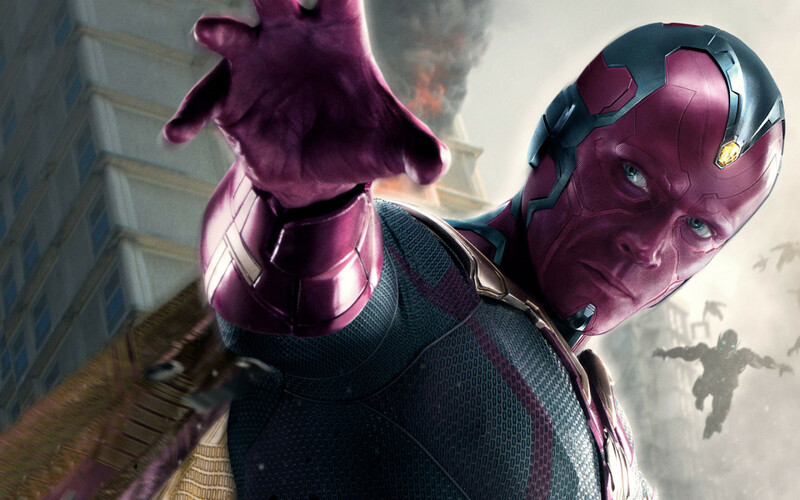 Vision was widely considered to be the first casualty of Avengers: Infinity War. There are two possibilities where Vision is left standing after Thanos come for him – Firstly, he loses the Infinity gem and is left critically injured but still surviving. Secondly, he outsmarts the Black Order and manage to escape. 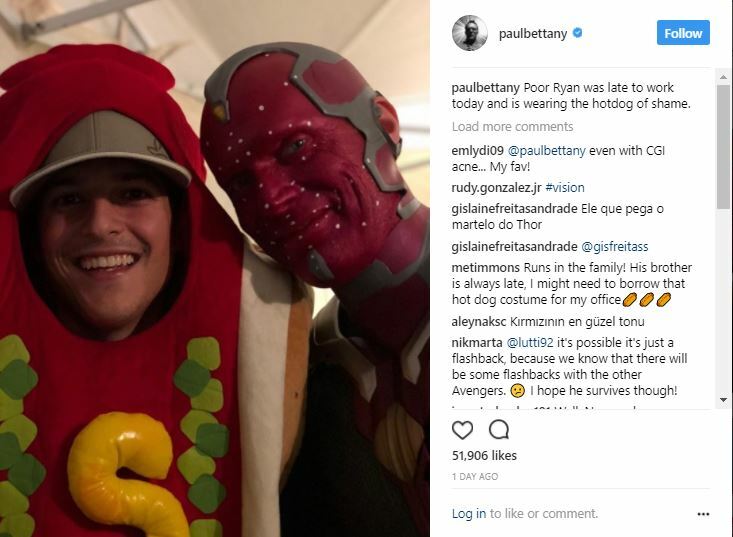 Paul Bettany is seen with another crew member with the latter wearing the hot dog of shame – something a crew member has to wear if they come late to the set. 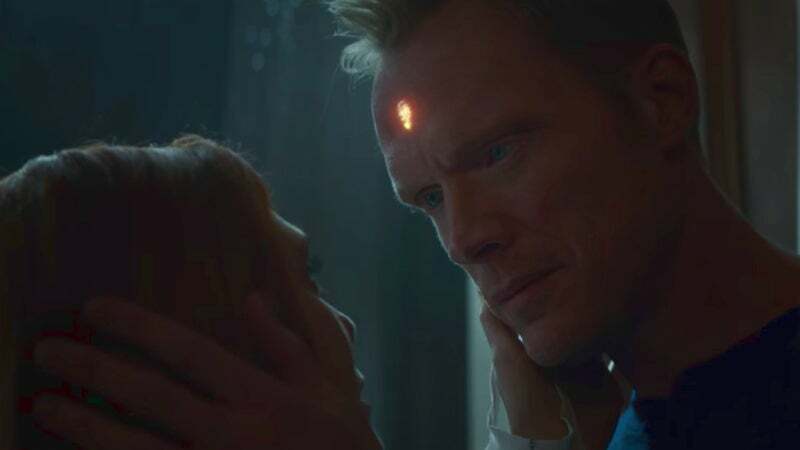 Paul Bettany can be seen in full Vision garb along with the Mind Stone intact and fixed on his forehead. So it means either of two things – either Paul survives Thanos or the movie has a flashback sequence. With the latter being abundant in Avengers 4, if rumors are to be trusted, it seems the most plausible option. But the former option cannot be completely overruled either. 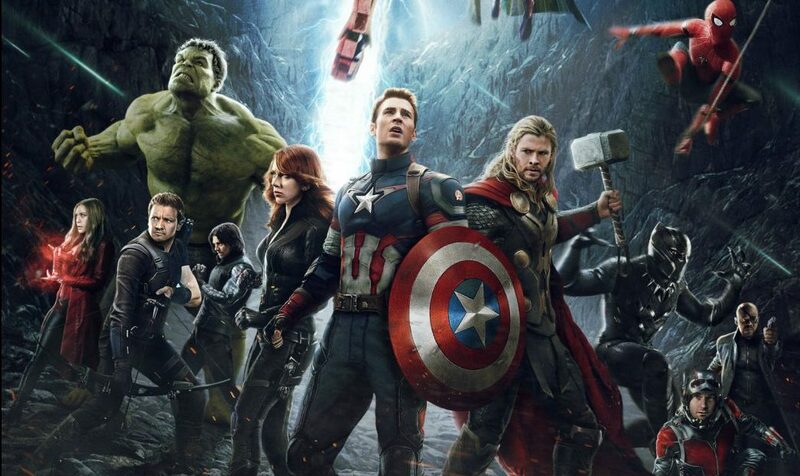 The MCU has had a legendary inability to kill off major characters in the past. They have always killed to keep the movies Disney-fied and kid-friendly. This lack of mature content in the plot has always made Marvel the laughing stock of the audience. And since Marvel never seems to learn from its generic plot devices, Vision might still have a chance of survival as of yet. The trailer of Infinity War promised a darker tone than the rest of the MCU. No one likes to see their favorite superheroes die. But killing off vision would be the better thing to do plot-wise. It would give much more depth to Paul Bettany’s character. Will Vision survive? Or will he die a horrible death? We might never know until we actually see the movie. 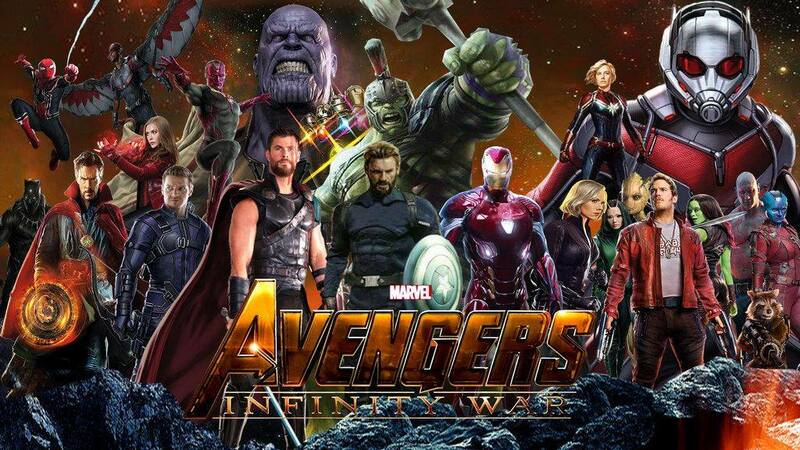 Avengers: Infinity War has a release date of May 4, 2018.